One of the most popular colors in the garden and one that is loved by every little girl is purple. Fortunately, nature gives us an abundance of plants that produce purple dyes. 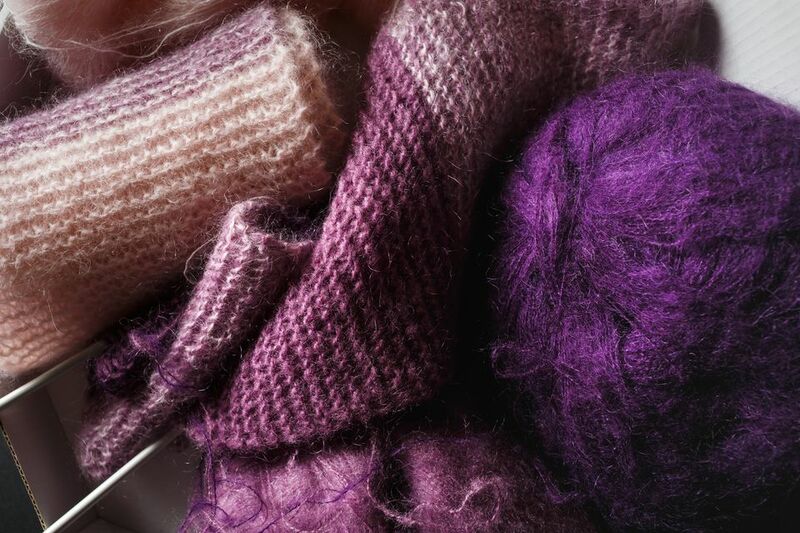 Learn how to create natural purple dyes from plants and then use it to dye fibers and fabrics for your home, clothing and craft projects. You can also use plants and natural materials to create a rainbow of other dyes. Make natural dye in the color black, blue, green, orange, peach or salmon, pink, brown, red, or yellow. Continue to 2 of 17 below. The same basil, Ocimum basilicum, that flavors your salads can also produce a nice purplish-grey dye bath. Different types of basil can produce different shades. Gather the leaves and stems and boil with water to extract the color. Continue to 3 of 17 below. One of the strongest purple dyes comes from blackberries. Blackberries can be found in temperate regions of North and South America. They can be found growing in sunny areas and often form thickets. You can also find varieties cultivated for the home garden that have no thorns. You may also use blueberries but the color will be much lighter. Wild or cultivated, just crush the berries to release their color. Add water to adjust the depth of color and be sure to strain the seeds! Continue to 4 of 17 below. A cherry tree is one of the many plants in the Prunus family and produces a fleshy stone fruit. Cherries can be red, maroon or even yellow. But is the roots of the cherry tree that can produce a purple dye. Whether cultivated or wild, boil the roots with water to release the dye. You can find iris blooming in every color of the rainbow. But, to achieve a purple dye you'll need the darkest purple iris blooms. One variety is even called "nearly black". Gather the blooms (fresh or dried) and use an alum mordant to achieve the dark bluish purple dye. Continue to 6 of 17 below. As with iris, you need the darker red blooms of daylily varieties to extract a purple dye. Gather the day-old blooms after they have wilted. Boil with water to extract the dye. Continue to 7 of 17 below. Elderberry, Sambucus, is a small tree or shrub found in temperate and subtropical areas around the world. The ripe elderberries can be used to make wine, cordials, and to dye fabric. While the berries are quite dark, you will find that elderberries produce a lovely lavender dye when the juice is extracted. Use the entire fruit with the skins boiled in water to create the dye bath. Continue to 8 of 17 below. Want purple dye? Use purple grapes-the darker the better! Use the entire fruit with the skins, boiled with water, to create the dye bath. If you want to skip some of the work, use commercial grape juice. Boil to reduce the amount of liquid and concentrate the color. Hibiscus is a flowering plant that is part of the mallow family. They are found in tropical areas and can be grown as a potted plant on patios during the summer. Hibiscus flowers are used to make teas and to season foods. They are also used to create food coloring. You can make a nice reddish/purple dye by using the dark red and purple fresh or dried flowers. Continue to 10 of 17 below. Huckleberries and blueberries are from the same plant family and each produce a blue edible fruit. You will usually find huckleberries growing wild in temperate areas of North America. Blueberries have been cultivated for commercial production and home gardens. To extract the juice, use the entire fruit including the skin with a bit of water. Crush the berries slightly to release the most juice. Huckleberries are typically lighter and color and will produce a lovely lavender dye. Blueberries will give you a deeper purple color. Continue to 11 of 17 below. Remember this, "here we go round the mulberry bush"? The mulberry, Morus, produces a berry that range from white to red to purple. The trees can be found throughout Asia, Europe, and the United States. The ripe fruit is edible and is widely used in pies, tarts, wines, cordials and tea. The red and black varieties will produce the best dye, a royal purple. Continue to 12 of 17 below. Pokeweed, Phytolacca americana, is a perennial plants native to North America, South America, East Asia, and New Zealand. There are around 25 varieties that all produce a berry that, when ripe, produces a deep reddish purple dye. The Constitution of the United States was written with pokeberry ink. Gather the berries fresh or dried to produce the dye. The raspberry, rubus idaeobatus, is the edible fruit of a perennial plant with woody stems. They are grown in all temperate regions of the world. The fruit can be red or black and some are even yellow. The darker fruit produces the richest flavor and the best purple dye when boiled with water. Continue to 14 of 17 below. Red cabbage, Brassica oleracea var. capitata f. rubra, is cultivated throughout Northern Europe, the Americas, and China. Its leaves are dark red/purple. During cooking, red cabbage will normally turn blue. To retain the red color, vinegar or lemon juice can be added to the pot. To create a rich purple dye, chop the cabbage leaves to release juice and add boiling water. Strain and use the dye. Continue to 15 of 17 below. The red cedar, Juniperus virginiana, is also known as Eastern Red-cedar, Eastern Juniper, Red Juniper or Pencil Cedar. It is native to eastern North America from southeastern Canada to the Gulf of Mexico. While the trees produces seed cones that are berry-like and dark blue purple in color, it is actually the bark and roots that will produce a purple dye. The bark is reddish-brown, fibrous, and peels off in narrow strips. The heartwood is pinkish-to brownish-red and releases its color when boiled. Continue to 16 of 17 below. The red maple, Acer rubrum, is one of the most common and widespread deciduous trees of eastern North America. Each year the foliage turns a deep scarlet but a closer look reveals that its flowers, petioles, twigs, bark, and seeds are all red. In addition to its use in landscaping, the red maple is used commercially for maple syrup production as well as lumber. To achieve a purple dye bath, gather the inner bark and boil with water to extract the dye. The sweetgum tree, Liquidambar styraciflua, is native to the temperate areas of eastern North America, Mexico, and Central America. It is easily identified by its five-pointed star-shaped leaves and hard, spiked fruits. It is also know as red gum because of its reddish bark. It is the light brown bark, tinged with red that will produce a purplish/black dye bath. The bark is deeply fissured and has scaly ridges. Combine the bark with boiling water to create the dye bath.